One of the greatest challenges facing photographers is dealing with the limitations of film or digital cameras in regard to Dynamic Range.Â Over the years photographers have been and continue to be very creative in managing the limited range of light in which film or digital sensors can capture. 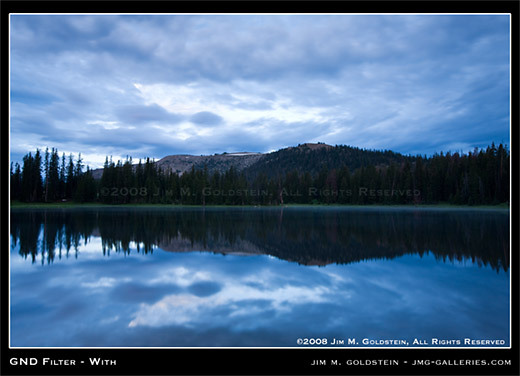 In an effort to best reproduce what our eyes/brain see, photographers have developed techniques that balance the exposure of scenes with light ranges too great for film or digital sensors to handle.Â Two techniques most often used to do this include the use of Graduated Neutral Density filters and now HDR image processing. The differences between these two techniques are critical to distinguish in that one, GND filters, are for all intents and purposes a pre-processing technique, while HDR is a post-processing technique. GND filters enable photographers to manually adjust how much light from bright portions of a scene reaches ones film/sensor when the photo is taken. HDR on the other hand is the blending of multiple exposures on a computer to create a single image with a dynamic range that depending on the settings can look similar to what the human eye/brain might see. While both of these techiques can work well they do generate different looks. Graduated Neutral Density filters in essence are plastic or glass filters with a graduated neutral gray color coating. 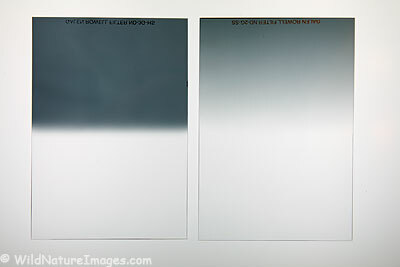 The transition between the graduated gray to the clear portion of the filter can either be “hard” or “soft”. Hard GND filters have a more defined and abrupt transition while Soft GND filters have a broader and more gradual transition. As to which type you should use depends on the scene you photograph. Some scenes will have a well defined horizon line such as an ocean sunset photo in which a hard GND filter will work well, while a lake sunrise photo with a treeline may require the more gradual transition provided with a soft GND filter. Using the right GND filter type will make the filters use transparent to the viewer of your photograph. 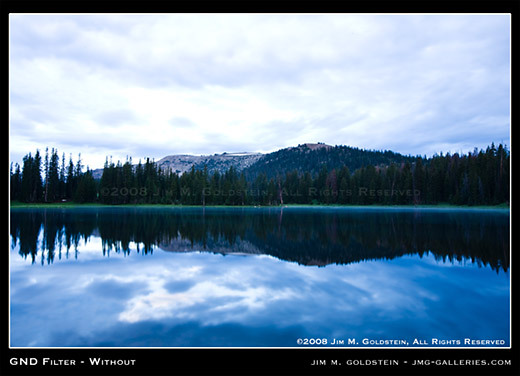 An example of a scene captured with and without a Soft 3-Stop Graduated Neutral Density filter. Note the detail in the sky that is recovered with the use of the filter. Even though I do mostly HDR now, the graduated neutral density filters still have a place in my camera bag, in particular for situations where things are moving too fast to get multiple shots, like aerial photography. Usually people think of these filters only when using a tripod, but it is entirely possible to use them off tripod. @Ann good point. Personally I think use of a tripod whenever possible is a best practice. Planes, boats and anything moving nullify the benefit of a tripod unless you're using it to support heavy gear. Great post of the effectiveness of ND's. I always carry two of Signray's ND's with me although I often forget they are in the bad and rarely take them out until I get back to edit the images and kick myself in foot for not using them. I love their effect to bring a sky a stop or two slower. @Teri I haven't written much about HDR as its not a technique that is aesthetically appealing to me 99% of the time. I've written an editorial piece on it that is less than flattering, but being an open minded individual I'll likely revisit HDR in future writing. - By the way the search is just below the tent in the upper right corner of the blog. I'll have to make that stand out a little more. If you are interested in more subtle/realistic HDR effects, you might want to look at a program called enfuse. It does some really impressive exposure blending.